Hotel Chambellan Morgane, Paris. Chambellan Morgane Hotel Paris. The hotel Chambellan Morgane in Paris is the perfect destination for those looking for a warm welcoming atmosphere, top of the line services and amenities. There is a friendly staff, available to help with any type of arrangements or requests, that will make for a relaxing enjoyable holiday. The comfortable, intimate setting of the hotel makes guests feel immediately at home. The interior decoration is sophisticated, elegant, yet welcoming and comfortable. 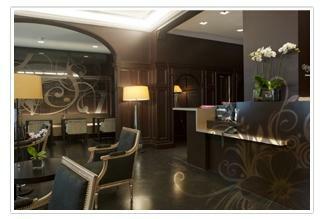 The hotel creatively combines charm with elegance, able to please the tastes of even the most sophisticated guests. The breakfast room serves a buffet each morning where guests will find all of their favorites to start off the day. The hotel also has its own bar area, the perfect place to enjoy a drink with friends before venturing our to the lively city sights, just around the corner from the Champs-Elysées. The Chambellan Morgane is a perfect getaway that caters to all your needs whether you're traveling on business or for pleasure. Free wifi in the rooms and in the common spaces.